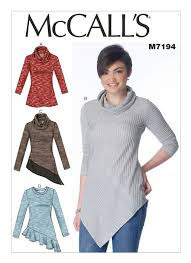 One of the quick and simple projects I sewed whilst away on my sewing retreat was a cowl necked knit top from McCalls 7194. It's only been in the last few years since I bought a cover stitch machine that I've started sewing more with knit fabric and I can see the appeal - so quick to sew and pretty easy to fit! I've made this from a knit fabric I bought from Darn Cheap Fabrics on a trip to Melbourne more than 2 years ago (a relative newbie in my stash!) that has little gold polka dots. I'm pretty sure it's 100% polyester and is quite thin without much stretch to it but it's a good layering piece. Because my fabric is quite thin the neckline is a bit floppy and falls in on itself instead of rolling over nicely but I still like it. It's pretty cold here in Sydney today so I'm wearing this over another long sleeved tshirt which is causing that bunching around my shoulders but otherwise the fit is fine. The back is pretty simple view - a bit of gathering around my swayback but more importantly it is long enough to cover up the waistband of my pants and keep my back warm when I was freezing on the sidelines of a soccer match early this morning. I can highly recommend this pattern. Other cowl neck patterns I've made tend to be quite low in the front and show off too much chest area which can get cold and it's awkward to wear a scarf with it. But this one has a nice high rounded neckline that you can either show by pulling the cowl down like I have in these photos, or hide by pushing the neckline towards the back so it's more turtleneck like. Gotta love options! 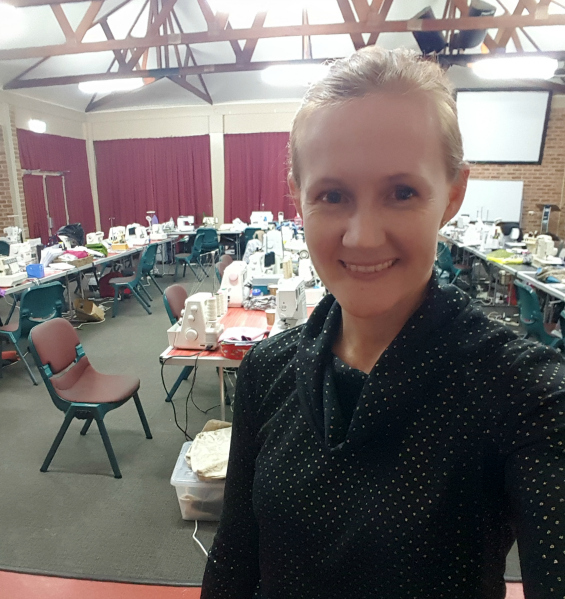 And here is a photo from the actual sewing retreat, there were about 35 ladies there each with multiple machines. The room certainly was humming when all those machines were sewing and everyone chatting!